This is review No. 2 of 16 in the first round of our competition. Each review will compare four burritos, with my favorite advancing to Round 2. 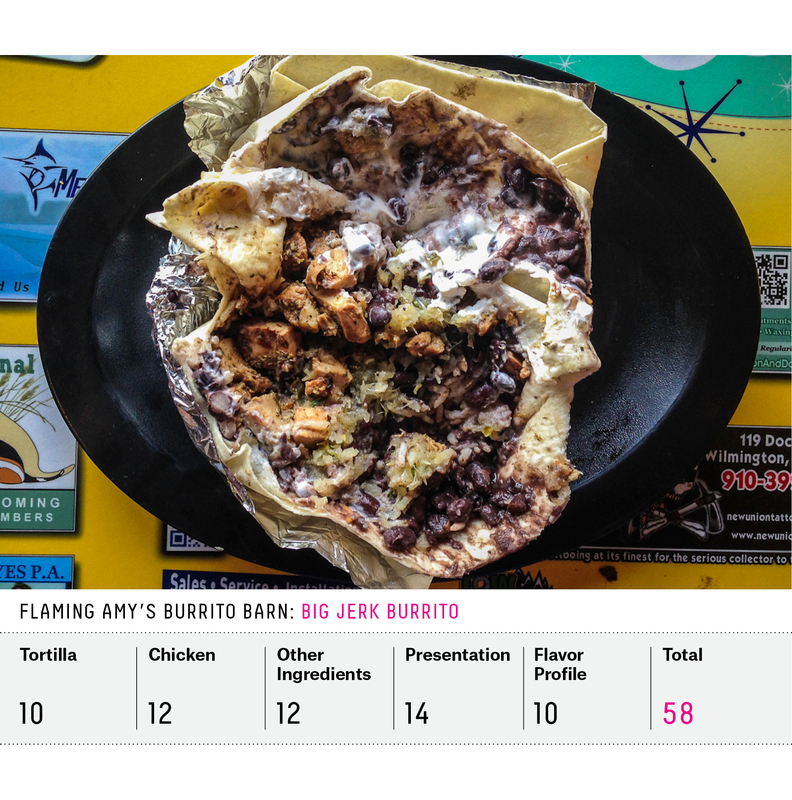 Anna Maria Barry-Jester is traveling the country in search of America’s best burrito. To see our Burrito Bracket and read more coverage, click here. This burrito face-off features four restaurants that hug the Appalachian Mountains in varying degrees. Two fall into the category of “world food burritos” identified by food critic Bill Addison, a member of our Burrito Selection Committee. 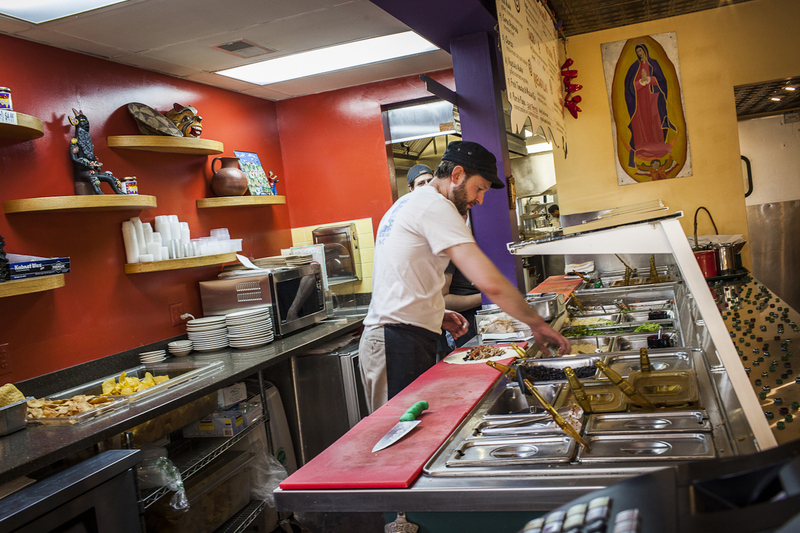 The third is an upscale college town burrito, the fourth comes from a Mexican grocer and tortilleria with a lunch counter. In a single review, we get a pretty good sense of burrito styles available in the South. 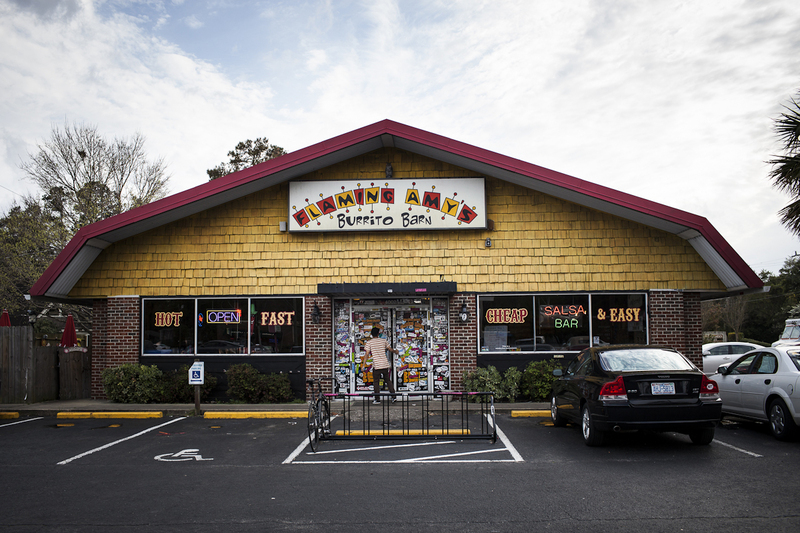 Flaming Amy’s Burrito Barn would be a nondescript building on a sprawling commercial road except that it’s painted bright yellow and red and plastered with bumper stickers. On the day I went, the place was offering 10 percent off to patrons with tattoos. I think I was the only one not getting the discount. The walls feature pink plastic flamingos and pirate flags. In the middle of the room, a salsa bar offers up inventive creations — wasabi avocado, pineapple jalapeño. These salsas know how to travel; the owners of Flaming Amy’s send them in care packages to soldiers deployed in Afghanistan. Flaming Amy’s has a menu full of world food options, meaning teriyaki sauce, Philly cheese steak burritos, Greek inspired creations, creole jambalaya. I wasn’t sure what to order. Every Yelp reviewer seemed to favor a different burrito, so I asked each of the folks behind the counter what was most popular and what was their favorite. Much to my chagrin, the “Big Jerk” was the favorite all around. I love jerk chicken, but I’m not sure it has any business inside a tortilla. The jerk was served alongside cheese, black beans and rice, and sautéed red peppers. Flaming Amy’s burritos come wrapped in foil, and are chubby and squat. On the first bite, I was sprayed with juice from the chicken, then smacked in the face with the strong flavor of oregano (which is apparently synonymous with jerk in this case). It was downhill from there; my chicken was limp and the sour cream was thin and pooled up next to a wad of tortilla at the opening (a personal pet peeve). But Flaming Amy’s has a vegan vibe and offers healthier ingredients than the average burrito — no salt to be found, simple rice and beans. All that said, if you’re surfing in Wilmington and you need a heavy dose of cheap calories, Flaming Amy’s is your place (especially if you’re inked). “What’s the favorite burrito?” I asked the guy behind the counter at Carrburritos. “Anything with chicken,” he groaned. When I commented on his tone, he lamented the monotony of making chicken burritos all day long. The workers then unanimously agreed that the carnitas burrito was their star. Carnitas it would be. Even though North Carolina has one of the fastest-growing Mexican populations in the United States (and Charlotte and Raleigh are the fastest-growing Hispanic markets in the country, according to Nielsen), this round of migration is from southern Mexican states (Querétaro, Hidalgo, Veracruz, Chiapas and Tabasco) where burritos aren’t popular. Taco carts abound and many serve burritos. Theirs are the smaller, border-style varieties with just one or two ingredients, thin and rolled (instead of stuffed and folded into a bundle). But the data and our expert’s research revealed no standout in that crowd, likely a result of the newness of the establishments, and the lack of any online presence. 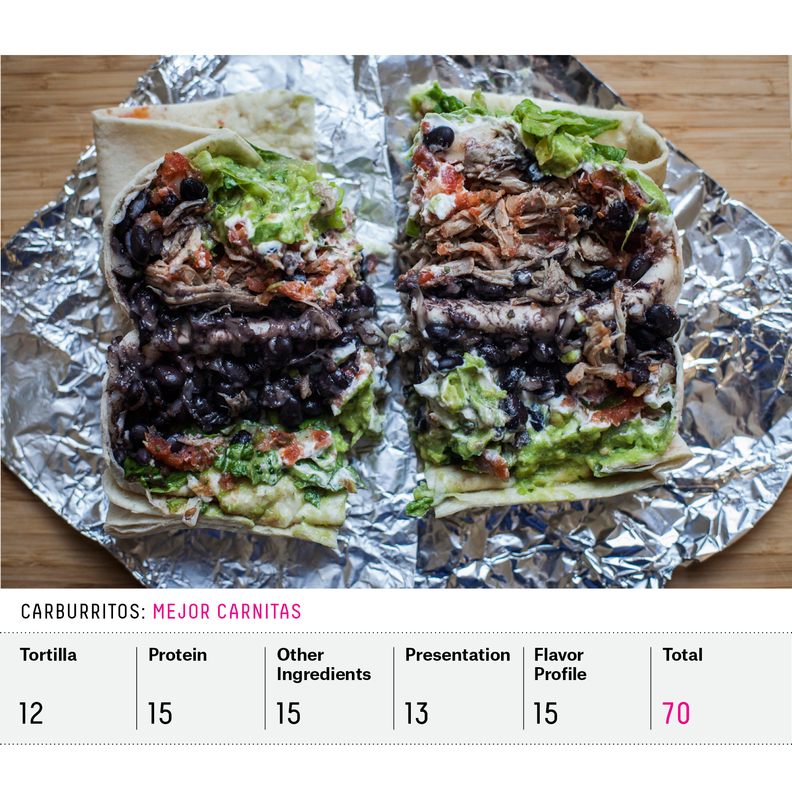 Carrburritos, on the other hand, is a classic college town burrito joint whose use of local ingredients and slow-cooked Southern style meats sets it apart. It shares the building with a Buddhist center and is full of good, colorful vibes. It was a gloriously sunny spring day when I visited, so we opted to sit on the outdoor patio, a small cement triangle enclosed by decorative iron walls. It’s prettier than it sounds. I ordered my burrito “mejor,” meaning it came with salsa, guacamole, sour cream, black beans, cilantro, pinto beans, white cheese and lettuce. The carnitas is certainly influenced by the great barbecue history of North Carolina, but slow-roasted with tomatillos and beer instead of peppers and vinegar. The meat was moist, with just the right amount of fat to give it flavor without being too heavy. The guacamole was fresh and chunky. You choose the salsa from a list at the register; the habanero actually has some heat (not a given in the South), and the fresca is indeed fresh, even if the tomatoes were a bit bland. I couldn’t find any bites that brought the guac and carnitas together, so I forced them into union with my fork, definitely an enlightened combination. The tortillas at Carrburritos are so thick that the guy next to me was waving his burrito around wildly in one hand while he told a story of the previous night’s antics, and it didn’t fall apart. That also meant I was a little tortilla-ed out half way through, eventually digging out the remaining ingredients with chips. 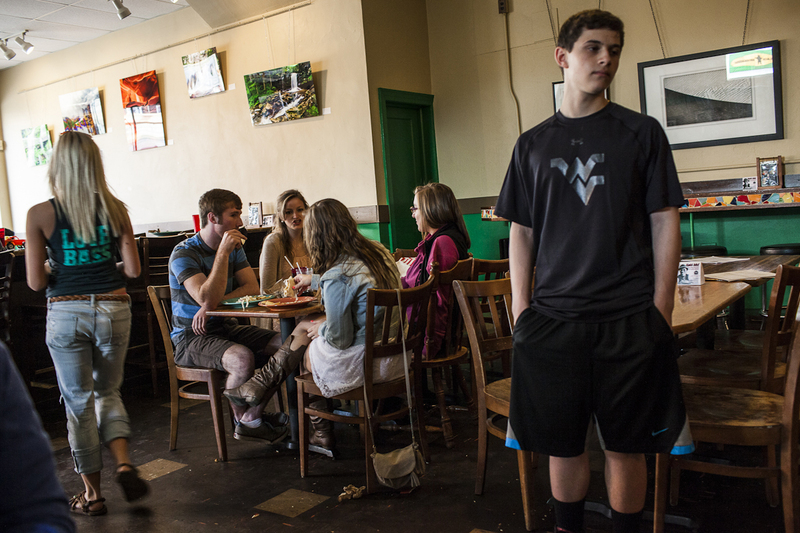 Morgantown looks nothing like the mountaintop-removal coal mining towns that have become synonymous with West Virginia in the last few decades. Steam pours out of industrial buildings on the edge of the city, but move a little inside the limits and this is a picturesque mountain town, built along the banks of the Monongahela River, and home to West Virginia University. Joggers and families stroll a carefully tended river walk, or dine on patios overlooking the water. 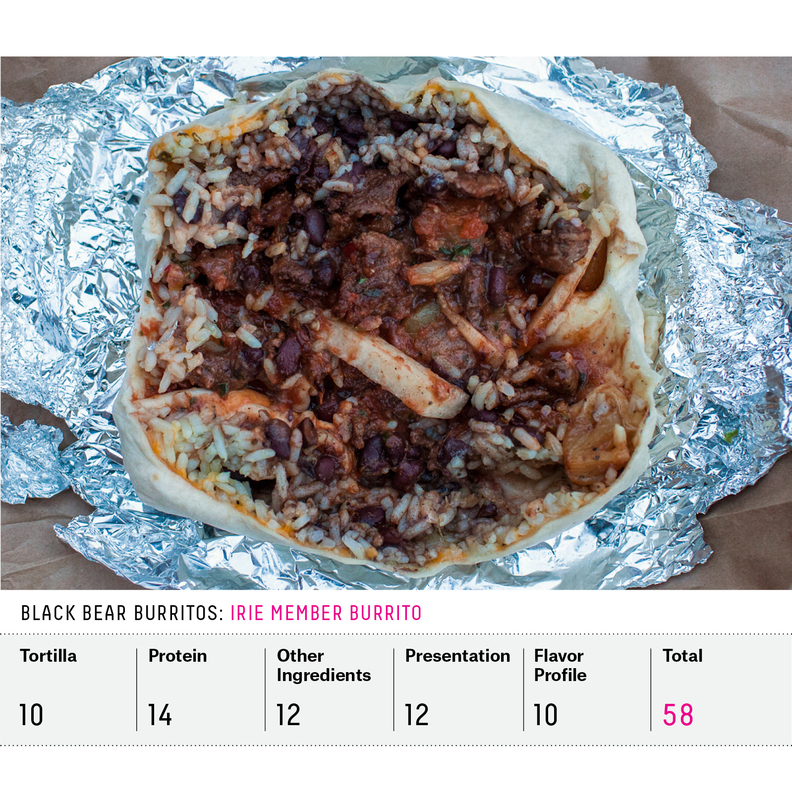 Black Bear Burritos forced me to a deep existential reckoning: the wrap vs. burrito conundrum. I’d fled the issue when I left Flaming Amy’s behind in North Carolina, but it pursued me deep into the Appalachian Mountains. The English language makes a distinction between a burrito and a wrap, both of which are easy to name at their extremes. Assigning hard and fast definitions, however, involves all the metaphysical subtleties and frustrations as the medieval theological question of how many angels can dance on a pinhead. When choosing the 64 restaurants in our national Burrito Bracket, we decided to leave it to the masses — meaning Yelp reviewers — to tell us what is a wrap and what is a burrito. But I don’t know, Morgantown, can a honey wheat tortilla pulled tight around swiss cheese, turkey cold cuts and sweet honey mayo really be a burrito? Let’s put it this way: I ate a “burrito” at Black Bear. I rated it. But I’m going on the record here: These are only just barely burritos. It’s not that they’re doing anything wrong, but what’s in a name? That which Black Bear serves if called a wrap would taste much more sweet. Patrons at Black Bear get points for ordering from the secret menu, which hangs from the refrigerator next to the register and is written in code. The combinations are surprising and unique. When you order, the cashier hands you a plastic toy to place on the table so the servers can find you. It was worth the trip just to watch a college-age woman in eight-inch metallic heels, hair dyed blond and curled, carry a plastic dump truck around the room looking for a table. Black Bear has live music several nights a week; on the evening I was there a man in an orange baseball cap played Dylan, Zeppelin and Appalachian bluegrass covers on the small stage. It was delightful. Again, I asked the woman at the counter what the best burrito was, and she recommended the West Virginia Hot Rod, which contains chicken, bacon and pepper jack cheese. I went with the “Irie Member” (pronounced “I remember”), another Jamaican-inspired creation involving local steak, cheese, rice and black beans, pineapple, jicama, jamaican jerk sauce, hot sauce and sour cream in a flour tortilla. At least I could compare it to Carrburritos without bringing the Thai One On (peanut curry, broccoli and pineapple in a spinach tortilla) or the Sergeant Pepper (pepper jack cheese, roasted bell peppers and green chilies) into the mix. The tortilla was a bit thick, while the locally raised beef was a total surprise — thin slices tender enough to swallow whole with the faintest hint of the grass the cattle grazed on. Two small pieces of jicama were fresh, juicy and wonderful, and left me longing for more in the vast expanse of this … burrito? The tortilla I had was essentially perfect, thin but sturdy, stretchy but not chewy. 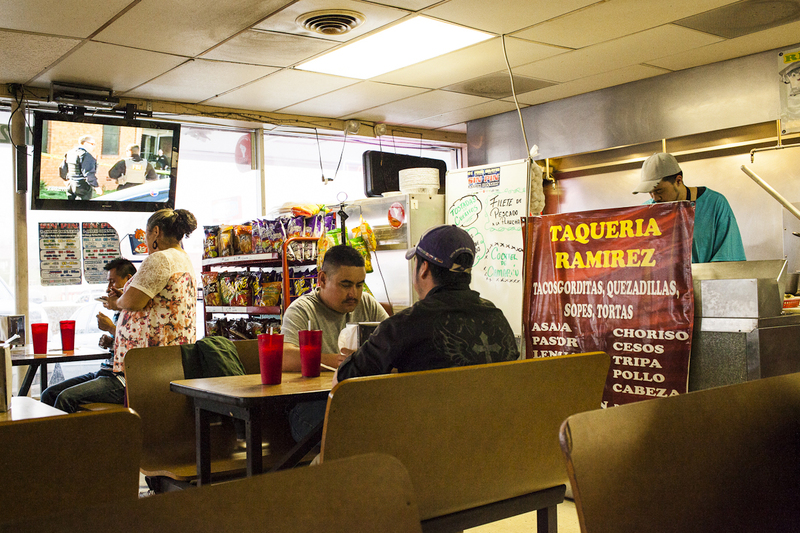 After you order, the folks at Ramirez griddle the tortilla, putting the crema and queso on top of the browning flour disk until it becomes a thick, gooey, tangy ingredient all its own. It’s the perfect compliment for the tender, flavorful carne asada. Then they throw on whole slices of jalapeño, spicy enough to add punch without knocking out your taste buds. Lettuce, tomato and refried beans are simple and supply the crunch, moisture and depth they’re there for. Scant pieces of Spanish rice round out the flavor. I loved this burrito. With no offense to the previous contestants, Ramirez restored my faith in Southern burritos. 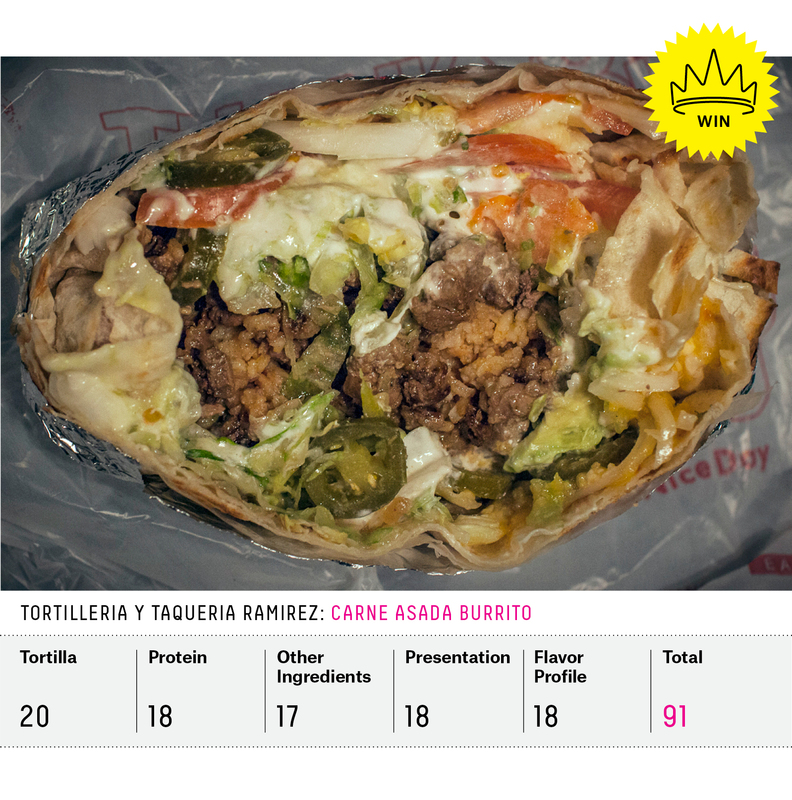 I feared that my excitement would lead me to an inflated score, but I feel strongly that this is objectively an awesome burrito, and it deserves a chance at a showdown with the greats of California. As a bonus, Panaderia Aguascalientes next door serves some of the best pan dulce I’ve had in the United States. The walls of the humble bakery are lined with enormous handmade cabinetry featuring breads in various shapes and colors. Even late in the evening, just before closing, the bread was soft and fresh. Don’t go expecting anything fancy; go for the food. At $5 for a carne asada burrito, you can’t go wrong. An extra dollar will get you organ meat — tongue, tripe and brains are all $6. Tortilleria y Taqueria Ramirez wins in a landslide. Value Over Replacement Burrito accounts for quality and quantity of Yelp reviews, while adjusting for location (the extent to which different geographical areas use Yelp, as well as how different locations rank chain Mexican restaurants). More on that in Nate Silver’s Burrito Bracket manifesto here.